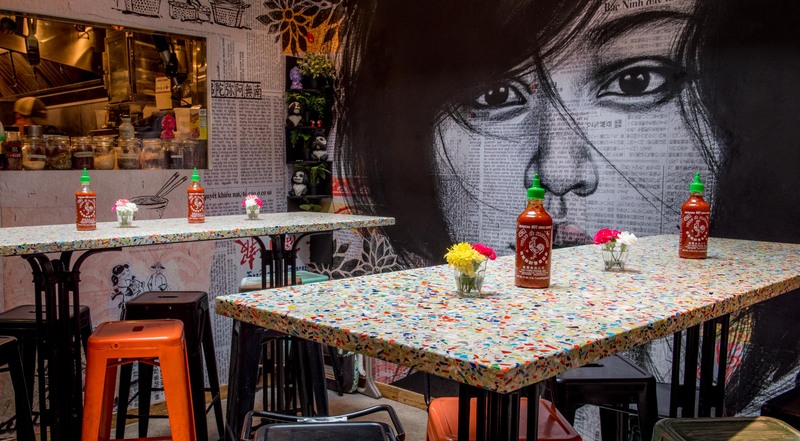 At this SoHo Cafe, Colour is always on the menu. Down on Lafayette Street in SoHo, NY there is a Vietnamese restaurant where the sun pours in through a sky light onto the happiest of tables ever to serve a bowl of Pho noodle soup. 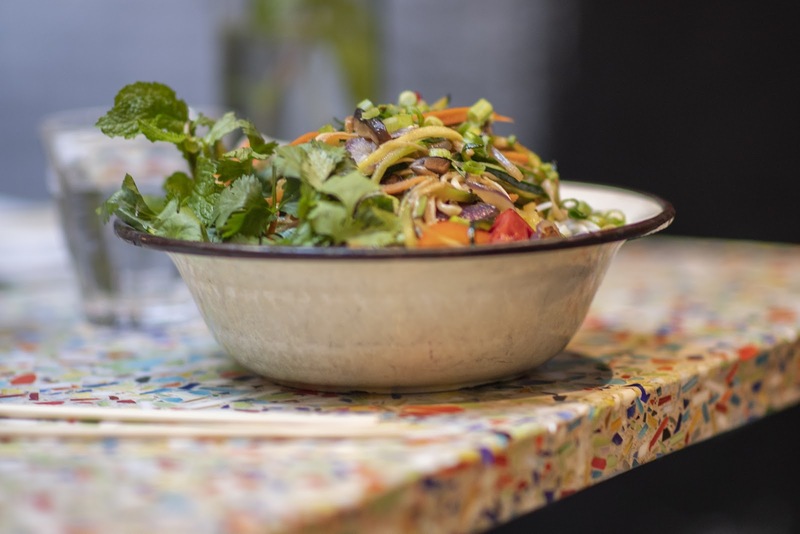 Here at BòCàPhê diners are treated to bright dishes of Vietnamese food with a French twist in a space that is as lively, cheerful and artful as the well crafted dishes they enjoy brunch, lunch and dinner. The vibrant hues of Millefiori come from a mix of art glass. The name Millefiori is Italian for a thousand flowers. 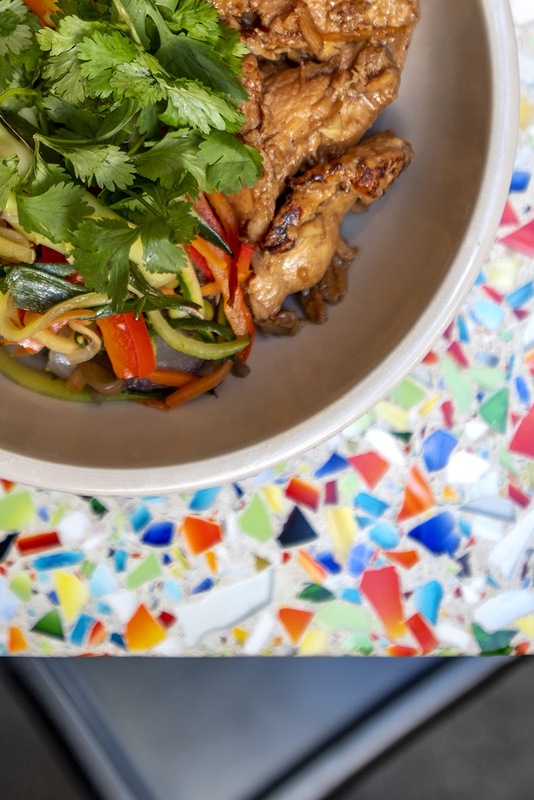 The decor features large-scale mixed media murals by artist Stephanie Ledoux, eclectic lighting and a healthy dose of greenery, anchored by recycled glass tables and a bartop made with an explosion of joyful color, perfect for a menu that packs flavor and color in every bite. The thick edge build up on this bartop showcases the stunning spectrum of colors in the Millefiori mix. Each slab is made by hand and no two are identical. 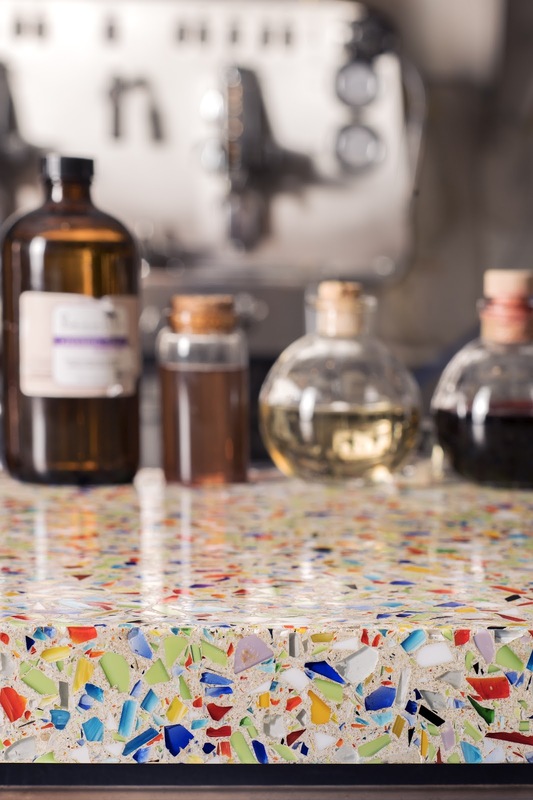 The recycled glass countertops are Vetrazzo’s Millefiori, a unique mix of art glass that originated from the artist communities of northern California. Owners Jeremie Mouyal and Raphael Louzon relied on the designers at Favoreat Design in Brooklyn to deliver a colorful, sustainable countertop material that would also make a great background. “The food in our restaurant is very healthy and environmentally conscious. Even in construction, we want to hurt the planet as little as possible,” Mouyal said. “We chose the Vetrazzo counters because we wanted something friendly to the earth and really original. It’s a very colorful and unusual material,” he said. “It’s a harmony between the dish and the background.”. At this cafe the menu is as colorful as the surfaces. BòCàPhê serves up fresh juices and bubble teas, noodle bowls with salmon and avocado (to name just one) and sandwiches like beef and lemongrass, with the colorful editions of pickled daikon, carrot, cucumber, jalapeno, cilantro on French baguette served with taro chips. Restaurateurs often choose Vetrazzo countertops for durability, sustainability and for the backdrop they create for food. But not all want such a lively palette. The chefs at Preserve preferred a neutral, earthy feel for their eatery.